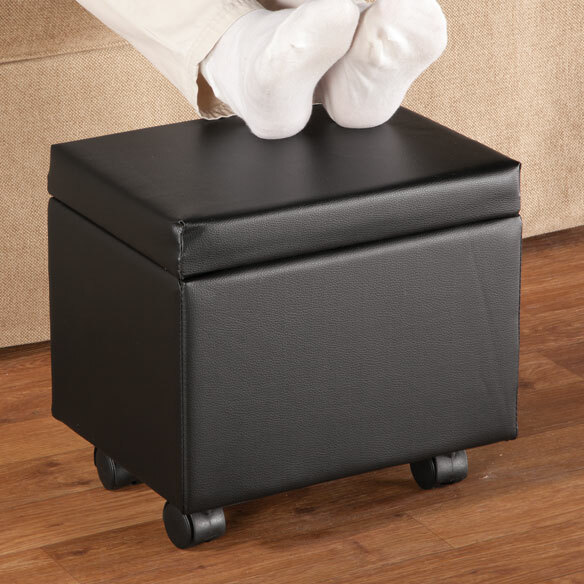 With multiple uses, this flip top storage ottoman is perfect for small spaces. Exclusively by OakRidge™ Accents, flip the top to use the flat side as a snack table. Remove the top to find storage space within. Side pocket. Plastic swivel wheels lock in place. Easy assembly required. 13" L x 10" W x 12" H. Vinyl covering. Wipe clean. 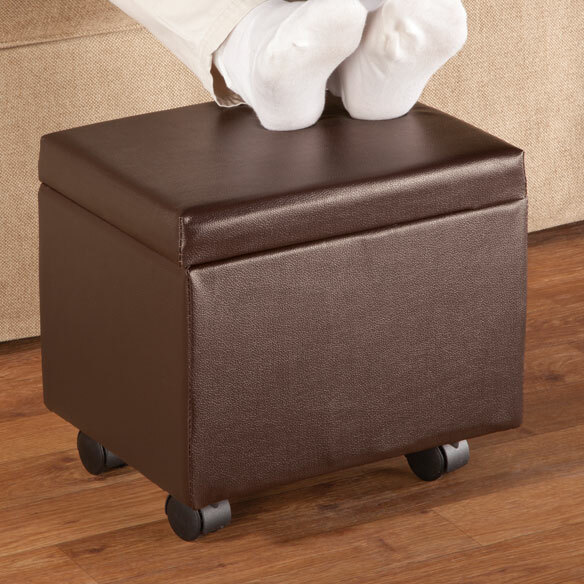 I use this foot stool in my bedroom so when I watch TV or read in their I can put my feet up and really relax. I really like this little stool and am so glad I purchased it. Need to put feet up often, easy to roll into place and roll out of way. Side pockets are easy to use, inside storage is large enough for most anything.Good value. Maybe not happy is a pessimist...or just got a lemon. I started with one, liked it so much, I now own 4. Yes, the holes for wheels are invisible, but if you read instructions, it's not that hard to figure out. I use it in front of TV chair, and occ. use it for foot rest, but I find it's usefulness in storing items I use while watching TV (pens, notebook for a quick thought or info to remember from ads, puzzle books, tissue, floss, etc. whatever you don't have). The product looked cute for my husband's purpose of raising his feet. For that it works fine. Really no cons to speak of, except looks are nothing special. A little overpriced in my opinion. Will write again with more use. This ottoman is nice-looking, and it's great that it is on wheels, but those are the only two positive comments that I can make about it. Otherwise, this child-size ottoman is MUCH TOO SMALL and TOO LOW (in height) for an adult to use comfortably! If the postage were not so expensive, I would have returned it; but, it looks as if I am stuck with it-- what a waste of money! I definitely regret this purchase. I looked forward to getting this product as I recently broke my ankle and need to keep my foot elevated.. When I saw the size and realized it would only elevate the foot about 16 inches I decided it would cost more to return it than feasible so kept it. On the second day the plastic roller on one corner broke beyond repair. Very smal size, will only hold a few paperback books in storage area, and elevation not really high enough to be restful. This was my first order from this company. This product was made in China and it shows. It came with wheels difficult to assemble. Directions were not true to statements. You would need a drill in order to secure the wheels. The placement for the wheels was missing. Inside was not secure and was loose fitting as far as poor fabric (more like dishcloth fabric.) The top of the ottoman was unglued and it was not what was expected. Great disappointment. Please consider manufacturing from the U.S.A. or seeking out quality goods. I just need something to get my feet up. My feet are swelling. So i can put my feet on. My dentures need relining and if I can save money doing it myself, why not? I have one similar and been looking for another one. I am getting 2 this time because one is for a friend . Needed a foot rest, but it was too low. Use it for storage instead. 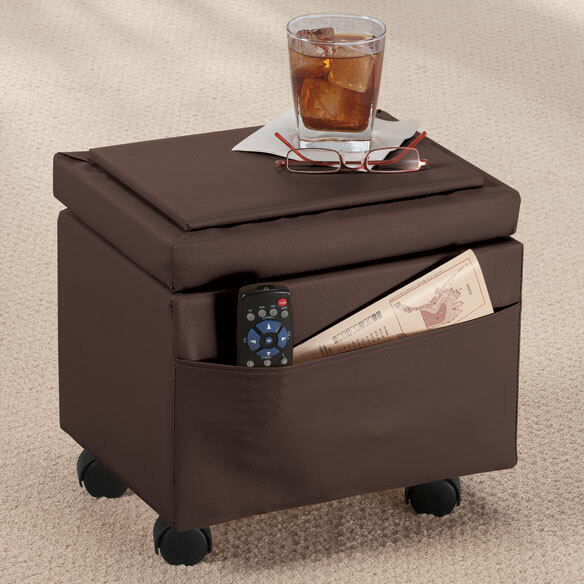 This ottoman is a gem,for putting your drinks on,an you can store things in it. Need an additional footrest, preferably with storage. Has storage and can turn lid for table. for storage and as a side tray for eating. It is very difficult to find ottomans on wheels, so I was happy to find this one at a reasonable price, along with an offer for free shipping. looked like it will fit our needs. The price is reasonable, to store misc. items and really fell in love with side pocket. Maybe I can keep up with my reading glasses and remote. I have a small space in a travel trailer. I am looking forward to receiving this ottoman. It is a small stool and doesn't take up a lot of room. It has storage space for my books, pens and remotes. It is on wheels and is easy to move out of the way. Limited space--needed ottoman on rollers which also had storage. it had rollers & like the storage. No reason - just did. Now I don't need it - I got a new chair. needed one, price was good. Size ,color and divers ability! yr. old to sit on whille kid talks to me? BEST ANSWER: Yes I keep mine in my RV and my Grandkids k be to sit on it. They are 5 and 7.
do I have to assemble it or does it come like the picture? BEST ANSWER: It has been several years since I purchased these. But if I remember correctly, the casters were inside the foot stool and I had to attach them with screws. It comes completely assembled. Like it's compact size and easy moveability.